I had the day off on October 8th and decided to go fishing at Morgan Run. Morgan Run is about an hour outside of DC and is managed as a catch and return fishery in select sections of the stream. I started off at the boulders section off Klee Mill Road. There were quite a few people hiking and wading into the water, but I didn’t see any other fisherman in this section. I also arrived mid-day, which isn’t exactly prime fishing hours, so that may be the status quo this time of year. The reports online said that the stream hasn’t been stocked since April 1st, but given the healthy amount of rain we’ve had; I thought it might be interesting to give it a shot. When I arrived, the water felt cool to the touch, and there was a good flow throughout the stream. The first spot I settled into was a classic falls into a pool, and I decided to fish a size 18 larva pattern I tie with a size 20 buzzer nymph as a dropper. I tight lined through the deepest part of the pool, and didn’t feel any hits after multiple passes. I noticed what seemed to be a small rise over by a boulder, so I decided to cast perpendicularly across the stream and let my flies sink and drift by the boulder. There weren’t any takes, but thought I felt a small take on the swing through the tail out of a pool. I decided to give this strategy a few more tries and on the third or fourth cast, I had hooked a tiny trout. 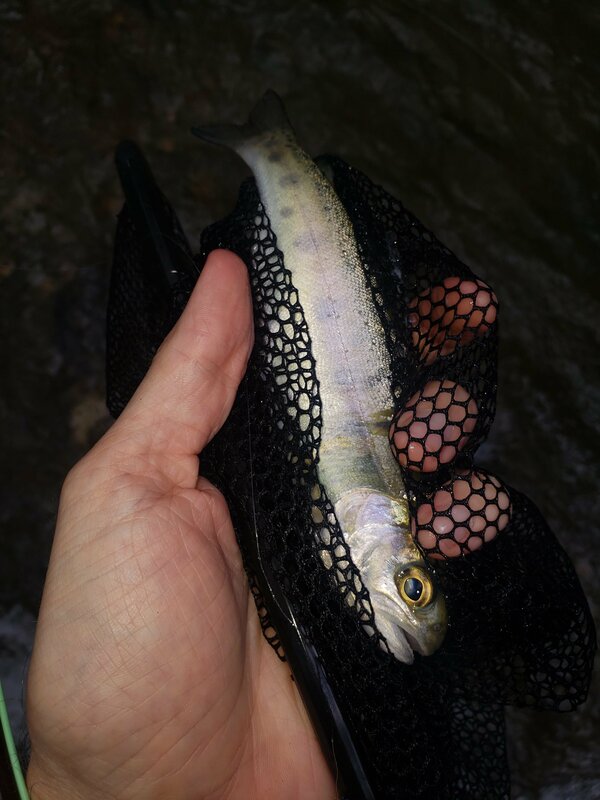 It seemed to be a baby rainbow, so I guess they stock fingerlings in this stream? I’d be interested to find out, but here’s a picture below. After landing that monster rainbow, I decided I’d trek up a little further and see if I could get past the hikers and people letting their dogs go for a swim. Morgan Run is fun place to fish with a ton of deep plunging pools and obstacles. The boulders section is especially appealing because it is so reminescent of a mountain trout stream. I could hardly walk 10 feet without finding another spot that looked like a promising trout home. Eventually I came to a spot that I felt must be holding a fish or two. I tightlined the first section and slowly moved upstream until I felt a take. This time it was a much nicer rainbow, and I was a little surprised. For some reason, I had imagined this to be more of a brown trout stream, because they are usually a more hardy fish to withstand rising temperatures. This trout looked extremely healthy and had a ton of energy. This didn’t seem to be a section of the river that saw a whole lot of people, so I imagine it’s been holding there for quite some time. All and all, Morgan Run was a fun excursion and I’m sure I’ll be back sometime soon. They don’t stock fingerlings there so the there must have been at least some breeding there the previous year. That’s a good sign. I don’t think any fall stocking had taken place yet when you were there, unless it was done by a local TU group (which I understands sometimes happens). Most likely the big guy you got was a spring-stocked fish and it survived the summer. Not surprising as I’ve heard there can be a 30% survival rate if the summers aren’t too hot. And this summer wasn’t too hot and we had tons of rain. The river is fishing well right now (Jan ’19) and should get an infusion or two of nice trout this spring so it should be a decent fishery this year! Thanks for your comment! Sorry I missed it, I had a bunch of spam comments come through in January and just got around to clearing them out. Wow, great to hear about the fingerlings. I’ve caught a couple of them, so it seems like there must be a little reproduction. I fished Morgan run a couple of times in January and had much better success than I did back in October. I thought that biggest trout may have been a holdover due to the quality of its fins. It’s nice to see a stocked fish living a healthy life, so I hope it stays that way.